Risk Analysts are responsible for evaluating portfolio decisions and forecasting potential losses that may arise in the company’s investment processes. These professionals identify the risks and workout on strategies to rule out such financial risks and guide with profitable decisions. The roles and responsibilities that are to be shouldered by these analysts include participating in valuation of derivate instruments; assisting the clients in modeling methodologies, determining the operational costs of the company, validating the soundness of model assumptions, detecting the disparities between the clients desired outcome with that of the company’s and determining risk assessment methods. A Risk analyst should be an analytical thinker, problem solver and have sound knowledge of risk modeling, statistics and probability; they should also depict sound finance knowledge strength in fields like financial analysis and financial management. A graduate degree is the minimum educational requirement for this job post; however, a Masters in Risk Management will prove to enhance the candidate’s Risk Analyst Resume. Headline : Proactive and results-oriented professional with over 6 years of experience as a Risk Analyst, directly supporting commodities trading activities; Technical expert in the oversight of commodity pricing management across multiple asset classes globally. Skills : Compliance, SOX Testing, Safety Committee Meetings, Completed Insurance Renewals, Improvement, And SharePoint. Providing independent support services to Chevron gas supply trading (GSAT) organization by focusing on. Performing daily market data validation ensuring the integrity and accuracy of forward and settle price imports into the trade capture system (ENDUR). Responsible for daily forward price load into ENDUR and risk simulations run impacting daily PL calculation. Liaisoning with the front office and it to resolve pricing discrepancies critical to the MTM reporting and risk exposure. Conducting third-party broker validation against trader marks across all nat gas traded indexes following SOX. Carrying out manual price calculations of ING contracts in the scope of facilitating accurate and timely invoicing of. Providing interactive daily system support to global nat gas ING trading infrastructure including the sign-off and initiation the of EOD process run. Overseeing master data additions, testing and maintenance targeting configuration of new traded indexes and portfolios which requires high-level knowledge of system complexities. Independently evaluate and monitor proper segregation of duties within endur via ownership of securities control and carry out system access quarterly reviews ensuring compliance to sox policies. Performing required system configuration changes, testing and trade data corrections impacting various global. Supporting regional and global process standardization initiatives by working directly with vendors to identify ways of market data cost reduction. Participating periodically in the in the special projects which required the cooperative interaction of cross functional. 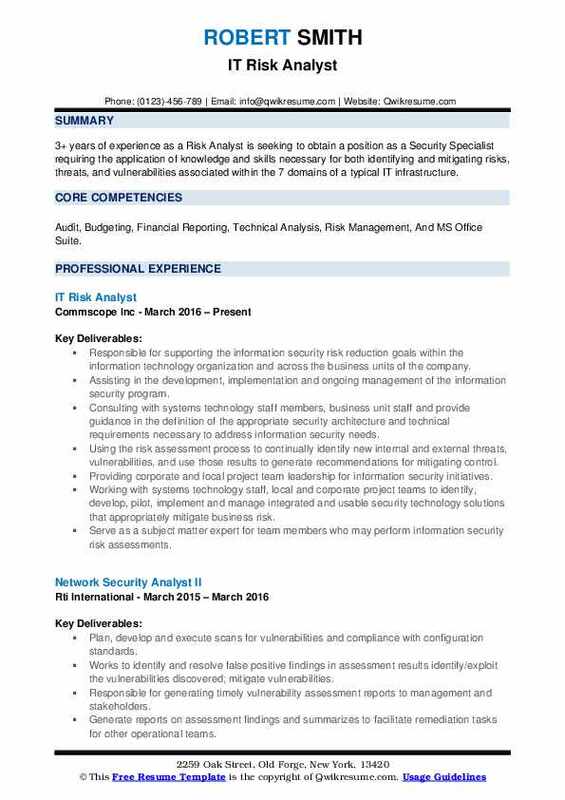 Objective : 3+ years of experience as a Risk Analyst is seeking to obtain a position as a Security Specialist requiring the application of knowledge and skills necessary for both identifying and mitigating risks, threats, and vulnerabilities associated within the 7 domains of a typical IT infrastructure. 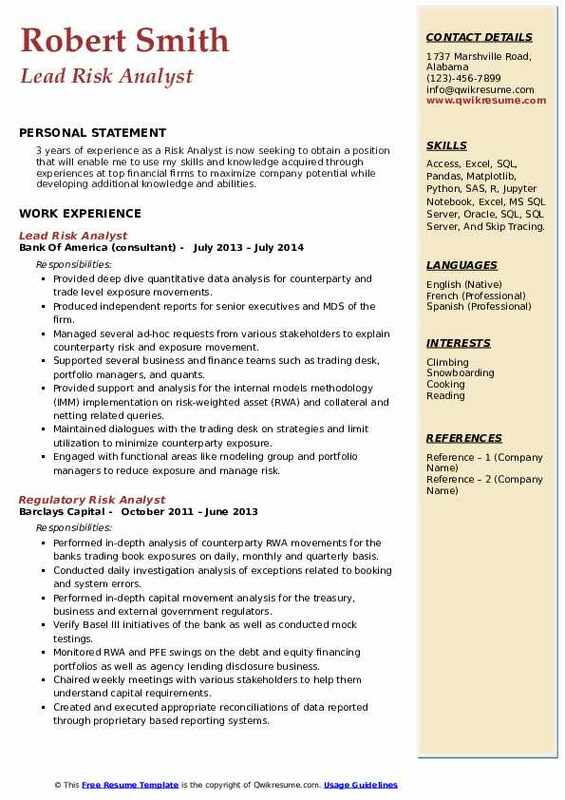 Skills : Audit, Budgeting, Financial Reporting, Technical Analysis, Risk Management, And MS Office Suite. Responsible for supporting the information security risk reduction goals within the information technology organization and across the business units of the company. Assisting in the development, implementation and ongoing management of the information security program. Consulting with systems technology staff members, business unit staff and provide guidance in the definition of the appropriate security architecture and technical requirements necessary to address information security needs. Using the risk assessment process to continually identify new internal and external threats, vulnerabilities, and use those results to generate recommendations for mitigating control. Providing corporate and local project team leadership for information security initiatives. Working with systems technology staff, local and corporate project teams to identify, develop, pilot, implement and manage integrated and usable security technology solutions that appropriately mitigate business risk. Serve as a subject matter expert for team members who may perform information security risk assessments. Provide technical ownership and continuous improvement direction for assigned technologies or areas of responsibility. Ensure that the controls environment and any related processes, procedures, and standards adhere to the NIST, iso, PCI, HIPAA, and sox. Develop and maintain documentation related to departmental processes, procedures and standards. Collaborate with the internal audit department in the planning, execution, response, and remediation of audit examinations and findings. Work closely with the internal audit department to gather information and respond to requests from other third-party vendors or business partners. 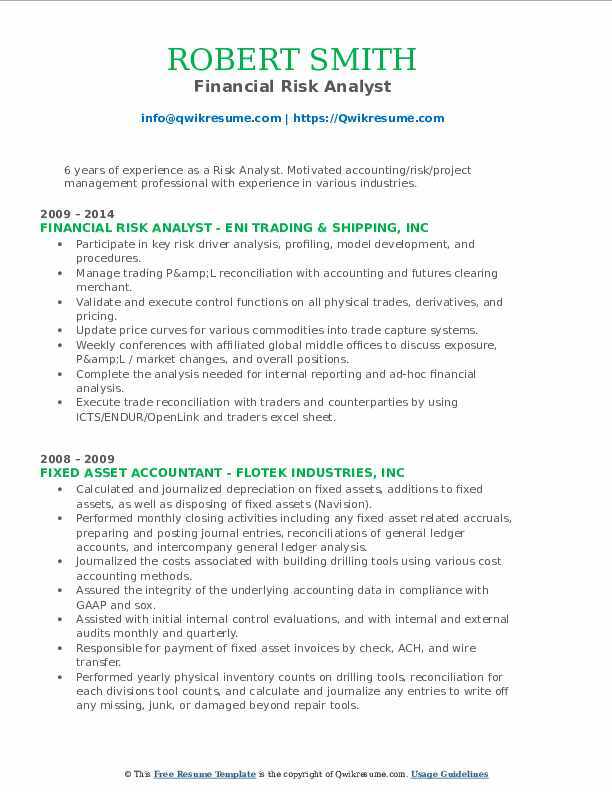 Objective : 2+ years of experience as a Risk Analyst, 1 year each as an Internal Auditor and Compliance Monitor. Looking for a great career opportunity. Skills : Mapping, MS Office Suite, Process Improvement, SharePoint, TOPO, Budgeting, And Monitoring. Contribution to monitoring and testing coverage plans and related metrics. Policy management- assesses changes in impact for current processes and controls and governance. Controlling gap analysis used questions to determine if controls are implemented to protect the confidential data. Identifying and document existing/emerging risks and potential audit issues. Performing gap analysis on key risks and controls (key risks, controls, and remediation). Providing consulting and subject matter expertise for mitigation and/or remediation planning. Risk governance compliance to design, develop. And implement a risk governance framework. Ensuring mitigation and remediation plans including action items, dates, and accountable parties and track deliverables. Proactively monitor to identify trends, emerging risks or deterioration of controls and ensure the effectiveness of test plans (monitor test). Proactively monitor key risk indicators (kris) and controls (including triggers, limits, commentary, and trends). Monitoring audit schedule, results, issues and action plans to ensure adequate preparation, coordination and. Monitoring and testing the effectiveness of the front line unit and control function compliance risk controls for flu/cf. 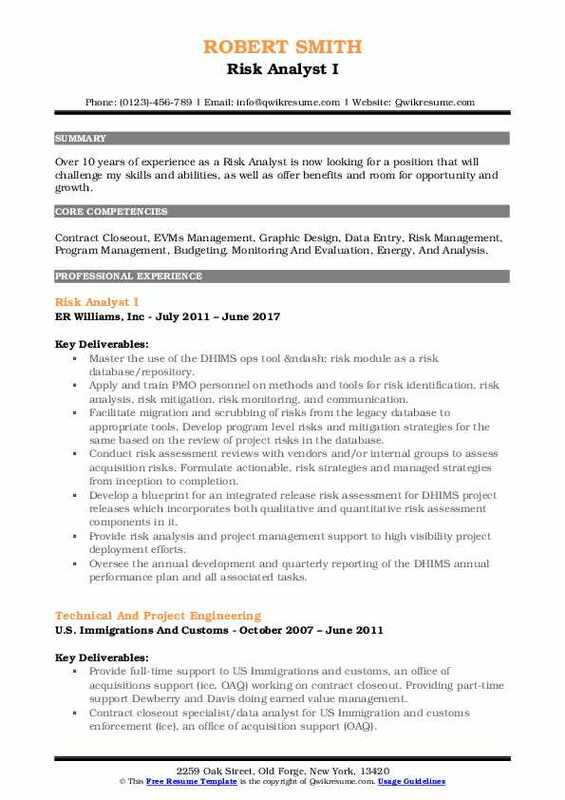 Objective : One year of experience as a Risk Analyst with proficiency in elicitation, and design of application software. Experienced with Capital Market, Market Risk, and Credit Risk and Basel regulatory requirements. Skills : Variance Analysis, VaR/Stressed VaR analysis, Outlier Analysis, Data Quality, SQL and VBA Programming, Automation of CCAR/DFAST Reports, And Time Series Analysis. Working on stress testing tests for comprehensive capital analysis and review (CCAR 2018). Working with Moodys and BlackRock solutions to check base, adverse and severely adverse scenario analysis, calculation of OTTI for the portfolio of bonds, implementation tests, benchmarking, sensitivity analysis for mortgages, US RMBS, CMBS. Analyzing the loss impact of auto ABS, international and domestic RMBS, CMBS. Have created reports like mortgage losses, aggregator analysis to study actual to model outputs for prepayment, default, severity amount, principal payment, etc. Liaison between business, model validation and it and coordinated with the offshore teams, handled weekly meetings. Working with leads for market risk data and strategy, the architecture of market risk technology and model validation. Enhancing automated market data checks, review of time series of key risk drivers, risk factors mappings, market data transformations and discussing results with market risk stakeholders for the purpose of var/SVAR and counterparty potential future exposures calculations. Analyzing and translating business needs in detailed requirements and functional specifications for market risk data and strategy group. Have worked on murex systems on sensitivities data sets and have implemented sensitivities like cr01, fx delta and vega, equity delta and vega and dv01 in the market data report by automating. 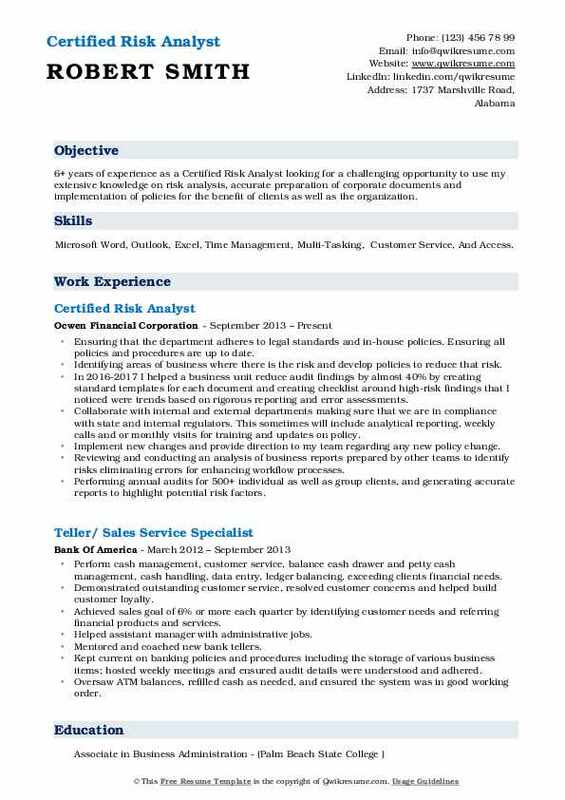 Objective : 2 years of experience as a Risk Analyst remaining observant while investigating suspected money laundering incidents. Collecting information on new & existing clients to determine potential financial, reputational and legal risk to identify the appropriate level of Due Diligence for each account. 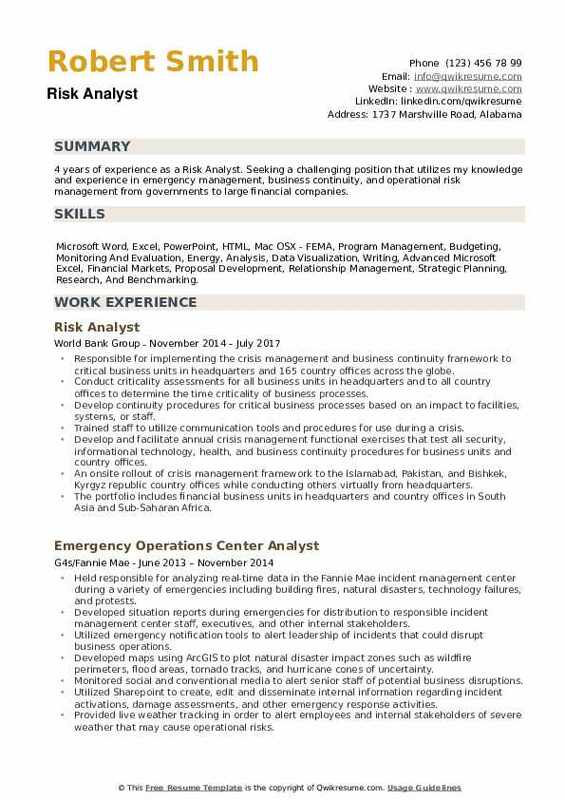 Skills : Excel, Microsoft Word, Powerpoint, Program Management, Budgeting, Monitoring And Evaluation, Energy, Analysis, Data Visualization, And Writing. Complete extensive due diligence investigations using public and private databases in accordance. With anti-money laundering (AML), BSA and other regulatory standards to assist business units and prevent operational and reputational risks. Conduct enhanced due to diligence research in attempts to find derogatory/background information. Used to aid decisions in initiating, maintaining or closing business relationships. Verify all aspects of client identification program (CIP) and necessary account opening documents. Are provided and in accordance with know your customer (KYC), USA patriot act and bank secrecy act. Identify accurate risk rating for individual/non-individual accounts to highlight high-risk jurisdictions. Cash-intensive/ high-risk businesses and politically exposed person(peps) or relatives or close. Evaluated financial stability and risk factors, while protecting and minimizing the impact for merchants. Applied defined fraud and global compliance practices, procedures and company policies to troubleshoot and mitigate risk. Work directly with customers to resolve fraud issues and handle merchant phone escalations with medium complexity from less experienced team members. Review merchant applications to gather information required to make a comprehensive assessment. 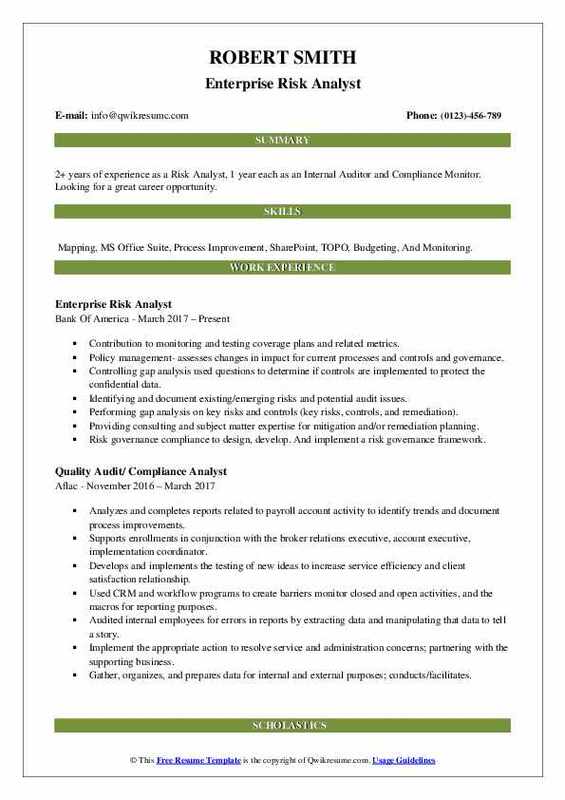 Headline : 6+ years of experience as a Certified Risk Analyst looking for a challenging opportunity to use my extensive knowledge on risk analysis, accurate preparation of corporate documents and implementation of policies for the benefit of clients as well as the organization. Skills : Microsoft Word, Outlook, Excel, Time Management, Multi-Tasking, Customer Service, And Access. Ensuring that the department adheres to legal standards and in-house policies. Ensuring all policies and procedures are up to date. Identifying areas of business where there is the risk and develop policies to reduce that risk. In 2016-2017 I helped a business unit reduce audit findings by almost 40% by creating standard templates for each document and creating checklist around high-risk findings that I noticed were trends based on rigorous reporting and error assessments. Collaborate with internal and external departments making sure that we are in compliance with state and internal regulators. This sometimes will include analytical reporting, weekly calls and or monthly visits for training and updates on policy. Implement new changes and provide direction to my team regarding any new policy change. Reviewing and conducting an analysis of business reports prepared by other teams to identify risks eliminating errors for enhancing workflow processes. Performing annual audits for 500+ individual as well as group clients, and generating accurate reports to highlight potential risk factors. Recommended appropriate risk management interventions for multiple business units and assisted to formulate policies for business growth. Partial releases of mortgages, deeds of trusts, easements, lot line adjustments and eminent domain. Review property appraisals and legal documents, obtain appropriate approval signatures, distribute funds in accordance with requirements, the forward recommendation to investor mortgage insurers and validate title insurance endorsements. Process corrective mortgages in a timely fashion by forwarding original documents to the title company for correction. Validate legal descriptions to plat map and notify appropriate departments of new legal description. Headline : 6 years of experience as a Risk Analyst. Motivated accounting/risk/project management professional with experience in various industries. Skills : Strong Analytical, Organizational, Observation Skills, Effective Verbal And Written Communication And Interpersonal Skills. Microsoft Office Suite, JD Edwards, QuickBooks Pro, Quicken, PeopleSoft, Lotus Notes, Navision, RTMS, Endur/OpenLink, FinMan, SAP, Arctic, Solarc, Oracle, And MS Project. Participate in key risk driver analysis, profiling, model development, and procedures. Manage trading P&L reconciliation with accounting and futures clearing merchant. Validate and execute control functions on all physical trades, derivatives, and pricing. Update price curves for various commodities into trade capture systems. Weekly conferences with affiliated global middle offices to discuss exposure, P&L / market changes, and overall positions. Complete the analysis needed for internal reporting and ad-hoc financial analysis. Execute trade reconciliation with traders and counterparties by using ICTS/ENDUR/OpenLink and traders excel sheet. Manage necessary preparation to start the transaction with new counterparties (credit vetting line and registration in ICTS/ENDUR/OpenLink as marketing system and Macola as accounting system). Assist accounting with issues to validate invoices with counterparties by using icts and front offices excel sheet. Validate account payable amount about the pipeline, storage and other marketing activities. Identify and communicate key risks or failures. Recommend ways to control or reduce risk. Maintain input or data quality in ICTS/ENDUR/OpenLink/mark to market. 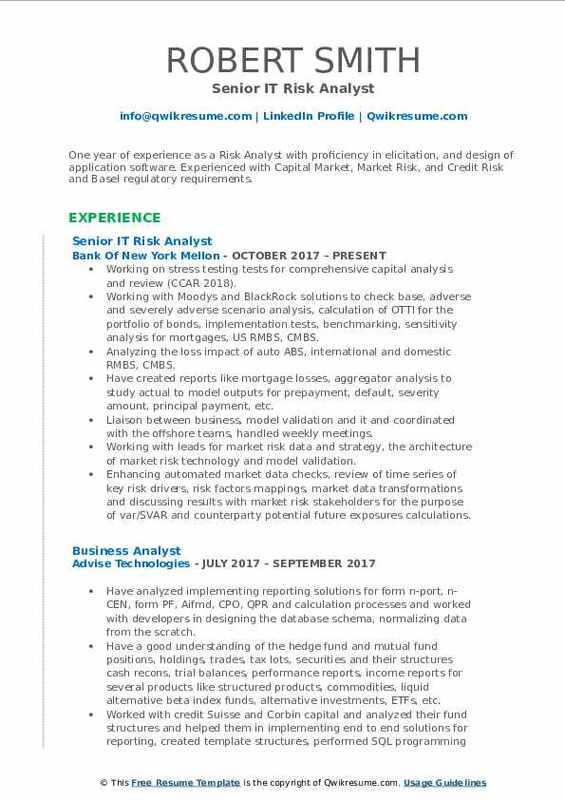 Summary : Over 10 years of experience as a Risk Analyst is now looking for a position that will challenge my skills and abilities, as well as offer benefits and room for opportunity and growth. Skills : Contract Closeout, EVMs Management, Graphic Design, Data Entry, Risk Management, Program Management, Budgeting, Monitoring And Evaluation, Energy, And Analysis. Master the use of the DHIMS ops tool – risk module as a risk database/repository. Apply and train PMO personnel on methods and tools for risk identification, risk analysis, risk mitigation, risk monitoring, and communication. Facilitate migration and scrubbing of risks from the legacy database to appropriate tools. Develop program level risks and mitigation strategies for the same based on the review of project risks in the database. Conduct risk assessment reviews with vendors and/or internal groups to assess acquisition risks. Formulate actionable, risk strategies and managed strategies from inception to completion. Develop a blueprint for an integrated release risk assessment for DHIMS project releases which incorporates both qualitative and quantitative risk assessment components in it. Provide risk analysis and project management support to high visibility project deployment efforts. Oversee the annual development and quarterly reporting of the DHIMS annual performance plan and all associated tasks. Collect and update performance reference model metrics for the exhibit 300 submissions for AHLTA, CHCS, and TMIP-j. Facilitate training sessions on DHIMS risk management project management. Facilitate annual development of the DHIMS annual performance plan with projects and internal groups. Introducing and implementing new analytical techniques, such as fault tree analysis, architecture-based risk assessment, and product release readiness assessment. Objective : 3 years of experience as a Risk Analyst is now seeking to obtain a position that will enable me to use my skills and knowledge acquired through experiences at top financial firms to maximize company potential while developing additional knowledge and abilities. Skills : Access, Excel, SQL, Pandas, Matplotlib, Python, SAS, R, Jupyter Notebook, Excel, MS SQL Server, Oracle, SQL, SQL Server, And Skip Tracing. Provided deep dive quantitative data analysis for counterparty and trade level exposure movements. Produced independent reports for senior executives and MDS of the firm. Managed several ad-hoc requests from various stakeholders to explain counterparty risk and exposure movement. Supported several business and finance teams such as trading desk, portfolio managers, and quants. Provided support and analysis for the internal models' methodology (IMM) implementation on risk-weighted asset (RWA) and collateral and netting related queries. Maintained dialogues with the trading desk on strategies and limit utilization to minimize counterparty exposure. Engaged with functional areas like modeling group and portfolio managers to reduce exposure and manage risk. Communicated key risks as well as analyzed and provided commentary on daily and weekly movements to senior management through regular meetings and presentations. Produced ad-hoc risk reports and analysis to communicate risk to senior management and stakeholders. Analyzed portfolio on a daily and weekly basis and communicated the drivers for the loss/profit. Daily analysis of the market risk profile of securitized mortgage trading businesses using tools such as var, stressed var, scenario analysis, liquidity profile, limit utilization. 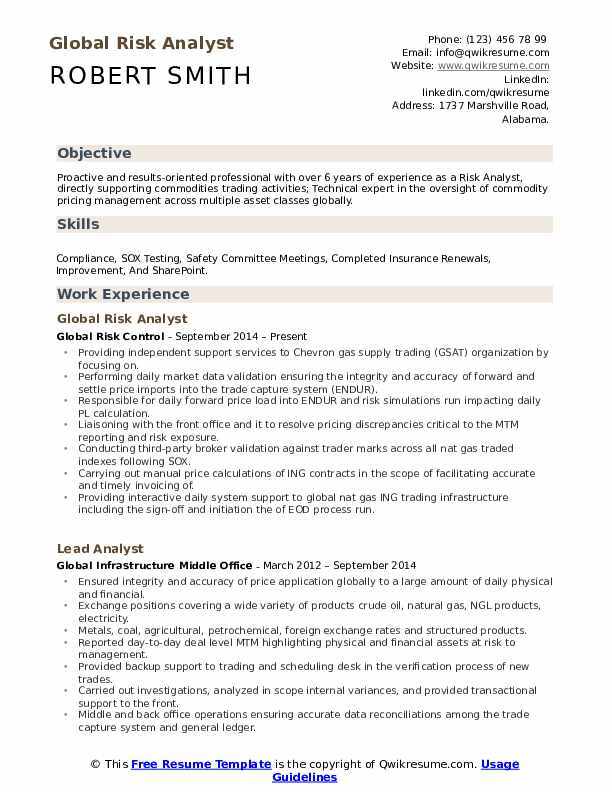 Objective : 4 years of experience as a Risk Analyst. Seeking a challenging position that utilizes my knowledge and experience in emergency management, business continuity, and operational risk management from governments to large financial companies. 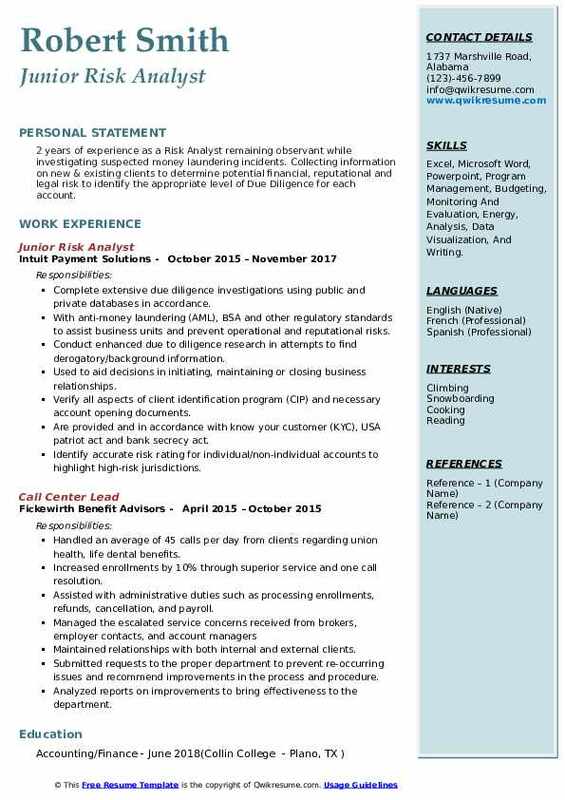 Skills : Microsoft Word, Excel, PowerPoint, HTML, Mac OSX - FEMA, Program Management, Budgeting, Monitoring And Evaluation, Energy, Analysis, Data Visualization, Writing, Advanced Microsoft Excel, Financial Markets, Proposal Development, Relationship Management, Strategic Planning, Research, And Benchmarking. Responsible for implementing the crisis management and business continuity framework to critical business units in headquarters and 165 country offices across the globe. Conduct criticality assessments for all business units in headquarters and to all country offices to determine the time criticality of business processes. Develop continuity procedures for critical business processes based on an impact to facilities, systems, or staff. Trained staff to utilize communication tools and procedures for use during a crisis. Develop and facilitate annual crisis management functional exercises that test all security, informational technology, health, and business continuity procedures for business units and country offices. An onsite rollout of crisis management framework to the Islamabad, Pakistan, and Bishkek, Kyrgyz republic country offices while conducting others virtually from headquarters. The portfolio includes financial business units in headquarters and country offices in South Asia and Sub-Saharan Africa. Helped develop a risk assessment matrix that ranked business units and country offices based on the threat of disruption by assessing security, natural disaster, and information technology events versus financial portfolio. Engage with senior management including Vice Presidents and directors to finalize and test plans. Recovery plans I wrote and implemented were used in incidents in many offices around the world.